Johnny Depp's Captain Jack Sparrow is a charming cartoon of a character. For the fourth Pirates movie the 'cartoon' takes enter stage and for the first half hour the film struggles as a result. 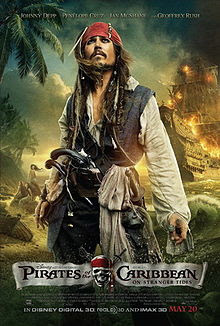 Initially it feels like 'Pirates' lite, with just a smattering of recognisable faces and Depp. Building the whole thing around the brilliant cartoon starts to feel like a mistake and the early scenes in London fail to capture any of the charm of the first two films. It begins as a disjointed mess with more actions sequences than witty one liners from Captain Jack. Once we're off on the high seas though things start to pick up as our (anti?) hero heads off in search of the Fountain of Youth and by the final half hour the film has dovetailed from a potential disaster into a proper Pirates film. Penelope Cruz is a welcome edition to the cast as is Ian McShane as Black Beard. Geoffrey Rush returns as Captain Barbossa and his presence and banter with Depp are some of the highlights. There's a superb scene with the best realised mermaids I've ever seen on screen. Real tension, beautifully shot and from that point on the film starts to find its feet. The danger with Captain Sparrow is that audiences will grow tired of him. But to be honest the biggest problem with Stranger Tides is that because he leads the movie there's too little of Sparrow being Sparrow. He has to be heroic without enough of the self interest that we've all loved in the previous films. The best scene in the whole movie is Depp running from a forest out onto a beach. It lasts about twenty seconds but it raised the biggest laugh of the whole film for me because it's Sparrow being Sparrow perfectly. It's worth it all though for the final half an hour. The action sequences are better paced, the scripting tighter and the movie briefly reveals that there really was a diamond in the rough here after all. If the whole film had been of this calibre we'd be talking about the best Pirates film yet. At times disappointing then but not as poor as some would have you believe and the 3D was well done. (Even if I do still feel like I want to step back fifty foot from the screen. Damn my messed up eyes.) Definitely one for the upcoming bank holiday weekend if the weather's a shocker.